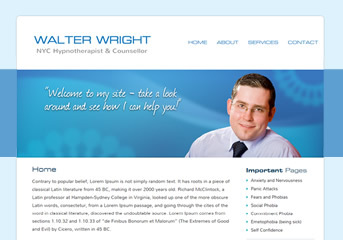 We specialise in offering complete website solution to therapists, so you can concentrate on what you do best. We can do as little or as much as you like. We can design you a stunning website to market your business, and we can also run everything for you. We have years of experience creating, maintaining, and promoting websites, so you’re in safe hands. From our range of beautiful pre-built website designs (themes) to our bespoke creation, all our websites are built with a strong emphasis on both design and usability. All our website themes offer great search engine optimization right out of the box. We'll also tune your site so that search engines love it just much as your visitors. We provide superior business class hosting (including email) for your website which includes state of the art features. Our hosting is fast loading, reliable and secure. 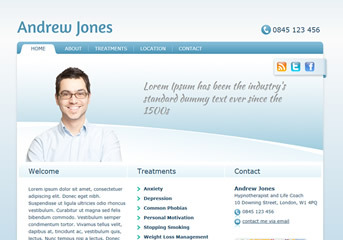 You will have full control over your website. If you can use a word processor then you can easily view, edit and update your own website without incurring any extra cost. If you prefer, we can deal with any updates or alterations that you can’t do or don’t want to do. We’re here to help and can take care of anything you might need assistance with. When you join us you’ll receive exclusive access to our VIP client area where we provide video tutorials and share tips to help you make the most of your therapy website. You may be thinking that our experience and expertise comes at a high cost. On the contrary... we offer excellent website solutions at affordable prices, with no hidden extras. All of our website themes are specifically designed to function on the hugely popular and easy-to use web publishing application know as WordPress. We build our themes using WordPress because it’s the perfect platform for creating modern websites that are aesthetically pleasing and easy to maintain and operate - and best of all, it’s completely free. There’s no need for special propriatery software or any knowledge of HTML - you can update your website online via your browser, anytime, anywhere. Or we can do it for you!